On the sidewalk at the edge of a parking lot, a number of women have set up informal displays of their goods. A wooden pallet is covered with a blanket and children’s clothing laid on top of that. An umbrella provides shade. We see a sudden flurry of activity, women with their arms loaded with blankets running to somewhere inside or behind the chop bar along the sidewalk. A pick up truck filled with men pulls up. They are not wearing reflective vests, or uniforms of any sort, nothing that identifies them as part of the Accra Municipal Authority. We watch as they start to seize the goods from just a few street sellers still remaining on the sidewalk. They pile them bag by bag into the truck. The beefy AMA enforcers literally push the street sellers out of the way. One young women is trying to throw bags of secondhand clothes into a car parked next to her street selling spot. The enforcer physically shoves her out of the way, grabs the bag out of the car and throws it into the pickup. Another woman swoops in and helps the women by grabbing some of their goods and taking them away. The street sellers argue with the men, but don’t become irate. After it is all over the one young woman, the one trying to rescue some of her goods by throwing them into a car, stands on her wood pallet looking forlorn. There are now quite a number of experimental designs and RCTs (randomized controlled trials) of market information systems measuring revenue gained by rural agriculturalists (farmers, fishermen) and traders. While some show improvements to the prices farmers get for their crops, others disappointingly show a lack of impact. There are also studies of agricultural extension services delivered via mobile phone which suggest that crop productivity is boosted by such services. How might these studies guide what actions are taken (i.e. to provide such services) in the real world? What is ‘ecological validity?’ It is the relationship between controlled, or lab-based experiments and what unfolds in a non-lab, non-controlled environment (aka the ‘real world’). Out in the world multiple variables interact in different ways. So what can we take away as actionable from an RCT that shows a market information system has resulted in boosted revenues for farmers who used it? How do we reconcile the successes with similarly designed studies that showed a failure of impact? Why do they do this? Because these studies intend to show what impact information (in isolation from other issues) has on markets, farmer profits, and revenues. That does NOT quite make these studies true evaluations of a particular system in real-world use. So what does this mean for the real-world use of MIS systems such as Esoko, Reuters Market Light, etc? For item (1) it means that a successful business model will most likely require that it be provided for free, (at least in the short to medium term) if it is to yield the effects measured by recent studies. For (2) and (3) it means that service adoption and literacy issues remain significant and substantial barriers. Artificially eliminating them for the purpose of an RCT is problematic because it obscures this fact. Fortunately, many programs in this space are finally becoming more attuned to this reality and offering such services through more user-friendly and accessible IVR or call center models (as Esoko now does). For more literacy-demanding services, training (or infomediaries) will be needed. Where training is needed, the scalability of such services is an issue. Susan Wyche and Chip Steinfield have a paper that’s just come out evaluating the user interface issues around MIS. They look at the affordances of such services and the challenges they pose for farmers. By contrast, RCTs championed by economists fail to address usability and literacy issues when they treat ‘information’ as the only important variable to isolate. It will likely require more interest and support for researchers with different kinds of training (HCI, social science) to make sure this important issue is not trivialized. Cole and Fernando (2014) ‘The Value of Advice: Evidence from the Adoption of Agricultural Practices‘ Harvard Business School Working Paper. Fafchamps and Minten (2012) Impact of SMS-Based Agricultural Information on Indian Farmers. The World Bank Economic Review. Nakasone, Eduardo (2013) The Role of Price Information in Agricultural Markets: Experimental Evidence from Rural Peru. Selected Paper prepared for presentation at the Agricultural & Applied Economics Association’s 2013 AAEA & CAES Joint Annual Meeting, Washington, DC, August 4-6, 2013. Hildebrandt, N. (2011). Teach a Man to Text. Esoko, Insights from the Field. Hildebrandt, N., Y. Nyarko, Romagnoli, and Soldani (2013). Market Information Systems for Rural Farmers: Evaluation of ESOKO MIS – Year 1 Results. New York University: Africa House Blog. A warm welcome to visitors who’ve found their way to this page from the Catholic Relief Services ICT4D conference. To know more about the objectives of this 5+ year research project visit our about page. If you are involved in an ICT4D project in the domain of agricultural, markets, and trade please visit our projects page to see if it is listed. If your project isn’t listed let us know (or post a comment below) and we’ll add it to our listings! A very small selection of hundreds of interviews with farmers, fishermen, traders, and others have been written up as profiles. Read these to get a richer sense of how ‘the poor’ and the ‘non-affluent’ manage, survive, and thrive with mobile phones in hand. Market information systems are growing in popularity as an intervention by governments, NGOs and private firms alike. New information provision for farmers, often price infromation over mobile, have been touted as a way of helping farmers improve the price they get for their produce, and reduce their dependency on middlemen. In our research we explored the impacts of connectivity in the tea sector in Rwanda, and we spent much time mapping the actors, information flows and relations that gave us critical insight into the potentials and limitations of market information systems. Before we come onto talk about market information systems, I want to talk about ‘price’ and I want to problematize the assumption that the low prices that smallholders receive are the result of a ‘lack of information’. Let’s look at the tea sector in Rwanda. In Rwanda it is only recently that smallholder farmers have been paid based upon a market price (as opposed to a flat government-set rate). So, the tea sector provides us with an interesting natural experiment to observe what happens when smallholders are exposed to market prices – do they seek out and use information and knowledge to improve prices? Not really! In fact we found little evidence in our research that new price-based trading changed farmer’s behaviour. Quality (and hence price of tea) is not really determined by elements that the farmer could influence. Price is more linked to international market fluctuations and to ‘natural’ endowments (location, soil quality, climate). For farmers who looked to increase quantity, the nature of land sub-division in Rwanda means that it is difficult for smallholders to greatly increase yields and new techniques, fertilisers and irrigation are rarely designed for smallholders. 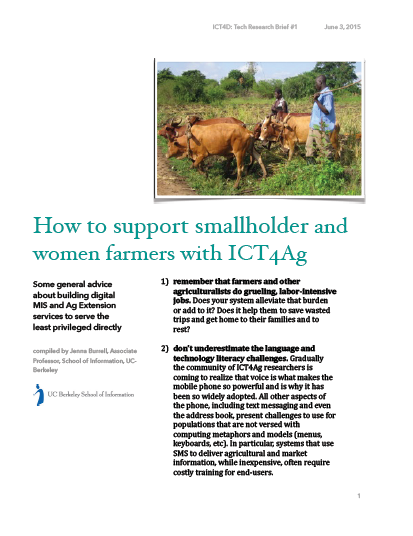 Finally, there is little room for smallholder to choose or skip intermediaries – tea leaf from smallholders needs to quickly be processed, so farmers have little choice about which processor they sell to. It has to be the nearest one. Even with the above reservations, we explored if smallholders might have some ability to improve their prices through information and knowledge. What types of market information are available and how are they used in the tea sector in Rwanda? There have been some sectoral efforts to disseminate price information in tea, and there is a price information system available. This market information system was supposedly accessible for tea co-operative associations (which all smallholders are a member of), but when we interviewed co-operatives there was an inconsistency in knowledge of the system: some co-ops had access, but some co-ops didn’t know the system existed, still others used other relationships to find out about price. In short, our feeling was that it was difficult for co-ops and smallholders to trust price information, and how they might use this to improve was unclear. There were also a number of other social factors that meant that efforts to improve tea through market information had been less than successful. The demographics of tea smallholders in Rwanda does not favour innovation. Agriculture in general, and specifically tea is not seen positively, and the backbreaking work of sowing, weeding and harvesting tea is not one to attract dynamic entrepreneurs – the majority of tea producers are male and older, whilst youth tend to prefer to look for work in the informal sector in a local city. In Rwanda policy also works against tea, where certain regions are exclusively assigned to tea growing, and so there is less ability for diverse portfolios or rich inter-cropping approaches for smallholders. In recent years there has been a growth in discussion of ‘pro-poor’ value chains, of poor farmer becoming involved in more commercially-orientated agriculture. Across the board, NGOs, donors and commercial firms have subscribed to this perspective and I think that market information systems is one element in this new paradigm in agriculture. Bringing development through profit, new clever finance, insurance, ICTs, market information and prices. However, pro-poor value chain approaches are often narrowly focussed on the immediate economics and neglect the structural (politics, colonial histories, land ownership), social (diversity of livelihoods, risk and gender) and complexities of production. Market information does have a place though. From our work in tea we see a number of ways that implementers and developers of market information systems might improve activity. As I hope this outline shows, the value of qualitative research is invaluable to designers. My recommendation would be that all market system designers should spend time seeking to understand the supply chains, the relationships and small holder goals before starting to develop any system. How does price break down in the supply chain? Where might price (or other) be useful and when might it not? In hand with this, our own evidence suggests that more integrated approaches are important for success – in terms information, such as price, farmer information (pests, fertiliser, skills), contacts, market intelligence, and in integrating the diverse communication ecologies of farmers. There is also value is designers thinking of information not only as a top-down exercise. In the tea sector, we saw sporadic online sharing between co-ops relating to tea management and production (horizontal rather than top-down information flows). Indeed, intermediaries such as cooperative were a key node in these information flows. Thus market information systems which consider bottom up information flows and intermediary players more overtly would be useful in improving the ability for market information systems to have impact. 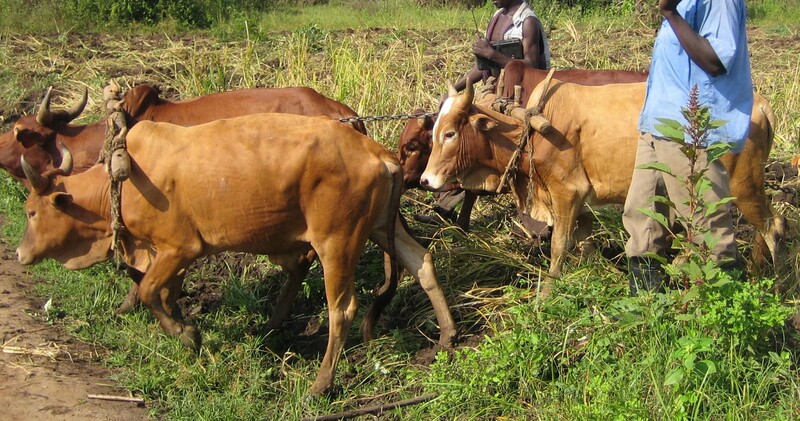 In the absence of agricultural extension officers (paid by the government to disseminate information and expertise on farming), many farmers rely on the local seller of agricultural inputs for tips and advice on handling crop diseases and pests and dealing with other farming problems. Many new mobile phone apps propose to deliver agricultural extension services via SMS or, in a few cases, through interactive voice response (IVR). An unanswered question is whether farmers are willing or able to pay ‘purely’ for information provided through these services. The agricultural product seller makes his money not directly from his good advice, but from the farming inputs he sells. His good advice may, however, draw farmers to his shop and motivate them to buy the products he sells. We are now in the process of analyzing data from last summer’s fieldwork on mobile phone use and money practices (conducted by Ishita Ghosh and Aisha Kigongo – with remote support thanks to Skype and Dropbox from Jenna Burrell). 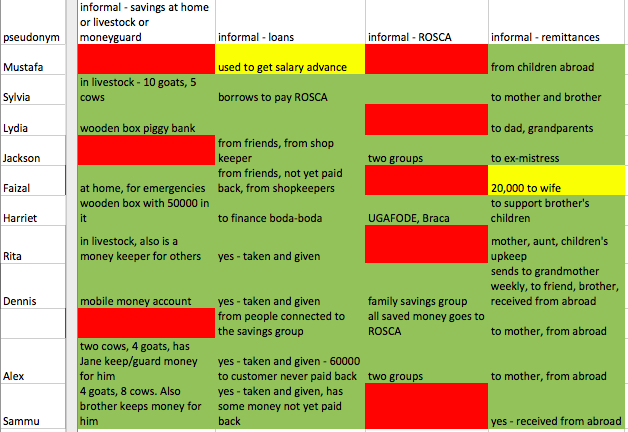 A standard schema of categorization when trying to understand the personal finances of low-income populations is to identify the repertoire of financial instruments used (bank savings accounts, bank loans, microfinance loans, savings groups/ROSCAs, remittances, etc). These instruments are, in turn, often grouped into two broad categories ‘formal’ and ‘informal’ [see Portfolios of the Poor (Collins et al) for a good example]. In development terms, mobile phones are defined within this schema as a gateway, an access point into the ‘formal.’ This is what is communicated by the notion of “banking the unbanked.” We are finding through our more all-encompassing approach to examining the multifaceted ways low-income populations incorporate the mobile phone into money practices that this division (and the presumption of a transition from informal to formal) is too limiting. Rather when considering the consequentiality of the mobile phone (and mobile money) more material concerns – liquidity, security, concealment/privacy, instanteneity, and obligation fulfillment at a distance — are perhaps better terms to reflect the concerns and advantages as they are framed by low-income Ugandans themselves. Below we have financial instrument usage for our research participants in Kampala, Uganda (the small subset that were interviewed weekly throughout the summer). Color coding offers a sharp all-at-once visualization of this breakdown. Red is for financial instruments the research participant does not use (at all and not ever). 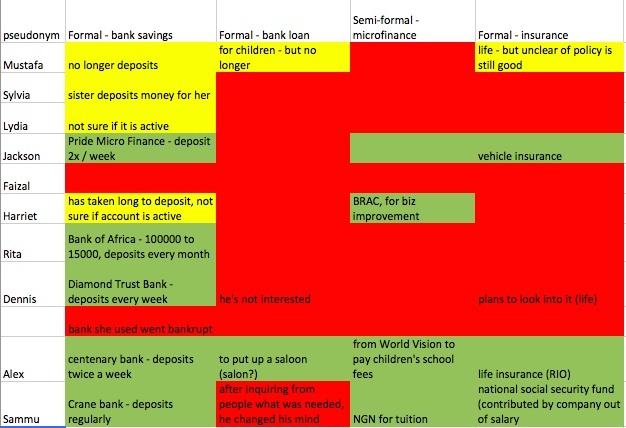 Yellow is for financial instruments used, but that are not an important part of the participants routines (such as a bank account opened, but almost never deposited into). Green is for financial instruments used regularly and part of money management strategies. Clearly the bulk of financial instrument usage remains in the ‘informal’ category rather than the ‘formal’ among these research participants. In Kampala, mobile money services have taken off (it’s another story entirely in our Delhi, India site). As much as mobile phone-based financial services might in some sense ‘formalize’ financial practices (for example, by creating a persistent record of money transfers and payments and by channeling formerly cash-based money movement through the networks of telecom companies and banks) they also resolve some recognized problems and limitations on the informal side. For example, phone calls and mobile money are a routine part of making requests for small interest-free loans from friends, family, and neighbors. They improve the ease of making such requests and also of seeking repayment. A question rarely asked is whether the mobile phone might make more legitimate and attractive the wide range of ‘informal’ financial practices. Might the mobile phone preserve informality? While the value of money transfer services for remittances (generally seen as ‘informal’) has been widely recognized, the mobile phone appears to have a role to play in small loans channeled through interpersonal relationships, and in the organization of savings groups (ROSCAs or chit funds).